- Total spend of $32.7 billion, a 1.7 percent increase over the current year, which is below the rate of inflation. - The national yearly change in the inflation rate is 2.13 percent. The 2018-19 state budget reflects only a 1.7 percent increase. - This budget will also put money into the Rainy Day Fund – for the FIRST time since fiscal year 2006-07! - The 2018-19 budget includes no new taxes and no new fees. House Republicans are committed to fiscal restraint so that citizens keep more of their hard-earned money. Conversely, since taking office in 2015, Gov. Tom Wolf has proposed increasing taxes with each of his budget proposals. His first budget proposal would have increased taxes $12.5 billion over the last three years. 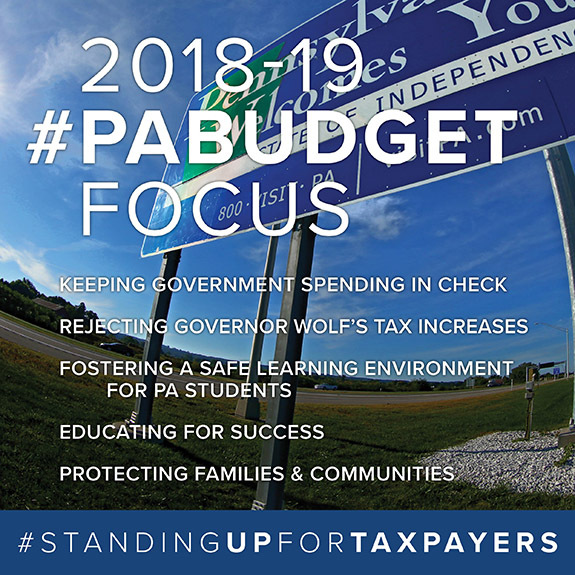 Though each Wolf budget proposal has been based on increased taxes, House Republicans pushed back and rejected all of the proposed tax increases. - Facility upgrades and more. - Basic Education Funding increase: up $100 million to $6.095 billion. - Early Childhood Education Funding increase: up $25 million to $251.5 million. - Special Education Funding increase: up $15 million to $1.14 billion. - Sets a Record High Investment of $12.3 billion for PreK-12 education. - Invests additional $25 million for Educational Improvement Tax Credit. - PA state-related universities: 3% boost. - State System of Higher Ed schools: 3.3% boost. - Community colleges: 3% boost. - An additional $30 million commitment to help prepare students and workers for in-demand jobs. - This budget will allow the Pennsylvania State Police to train three new cadet classes, which will add an additional 285 troopers to protect communities throughout the state. - There is an increase of $5.5 million for nursing homes rates. - This budget includes money to take care of those with intellectual disabilities, allowing services for an additional 965 people living with intellectual disabilities. - This budget includes funds to provide evidence-based home visiting services to 800 families affected by the opioid epidemic. - Emergency Medical Services agencies throughout Pennsylvania have been struggling to do more with less. The budget provides an increase of $4 million for our EMS agencies. - The health line-items that the governor proposed to cut in his February budget proposal are being funded in this budget. - There is a new Lyme Disease line-item to help combat and treat those affected by this disease. - Bio-Technology Research, ALS Support Services, and Regional Cancer will see increases in this budget. - The budget plan includes a new $3 million line-item to combat the spotted lanternfly, a significant threat to many Pennsylvania ag commodities. - Penn State Agricultural Research and Extension will get a 3% increase. - The University of Pennsylvania Veterinary School and the Center for Infectious Disease will receive a 3% increase. - Veterans Homes in Pennsylvania will receive a $5.7 million increase. - There is an increase for educational assistance to the National Guard. - Veterans Outreach Services will receive a 21% increase in funding.